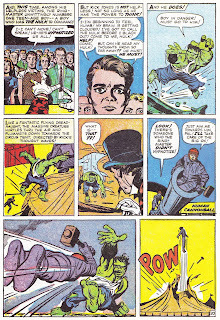 The intelligent Hulk bit had already been done by Lee and Kirby in the 60s (like most everything in Marvel Comics), but this was the start of a protracted storyline using this gimmick. 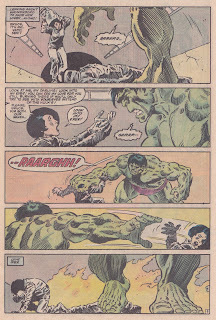 Indeed, the Hulk has never returned to the straightforward “Banner angry = Hulk” scenario since the early 80s. There is always added psychological baggage now. So there you have it, Sal Buscema. 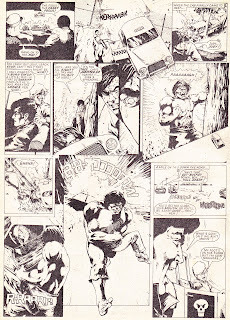 The first Hulk comic I ever read was most probably the simply titled Hulk Comic #1 in 1979. 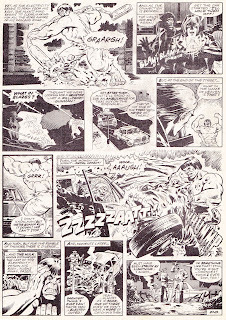 It was the start of a weekly series that had a fair amount of original material in, as opposed to the traditional Marvel UK format of reprinting US stories. 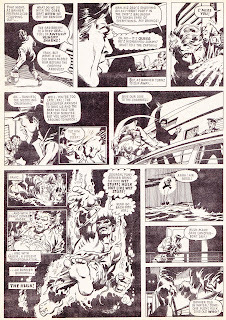 This comic was an anthology, in the manner of most UK weeklies, and notably had David Lloyd's Night Raven in - a kind of prototype for his later V for Vendetta, and Steve Parkhouse and John Stokes' Black Knight - which featured Captain Britain. It was a pretty classy product, a uniquely British take on an American icon. Next time I'll get onto a stalwart of the Hulk series who worked on it for a decade or so. 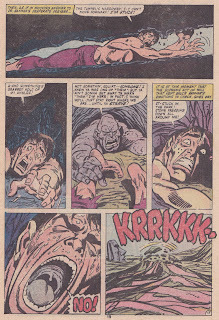 Another artist who worked on the Hulk, almost from the beginning, was Steve Ditko. This great artist is probably best know for co-creating Spider-Man and Doctor Strange, but he has done loads of fascinating work over the decades. 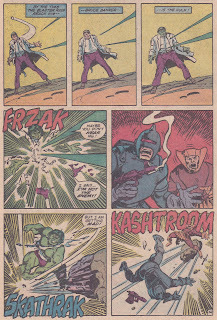 In the original six issue Hulk series, he inked over Kirby's pencils, and drew the 6th issue. 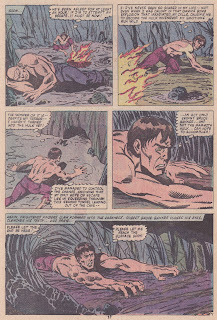 After this, the Hulk appeared in Tales to Astonish regularly, drawn by Ditko. 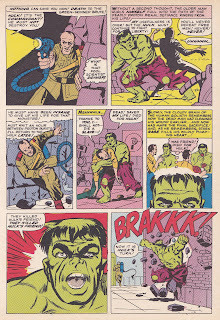 The page above is from 1965, and in it we see an emotional scene where Hulk is upset because his new friend has been cruelly cut down by a deadly proton beam, held in the hand of "the fanatical commandant of the red weapons testing centre". Very moving when you're 8 years old. And then it's time for a rampage. Yes! I didn't read these comics in the 60s - that was before my time. 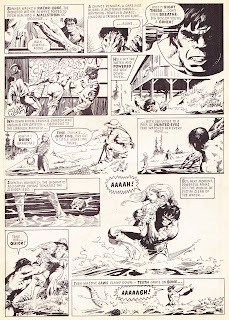 Luckily enough, when I was growing up Marvel UK were reprinting the 60s stuff as pocketbooks. Alongside this they were also reprinting current stories, one of which was a Ditko story - an excerpt of which is shown below. I didn't really know there was a 15 year gap inbetween the stories. I just knew it was all Ditko and all good. When I was growing up the Hulk came on TV every week in the guises of Bill Bixby and Lou Ferrigno. I loved this show and it triggered an affection for the character that lasts to today. 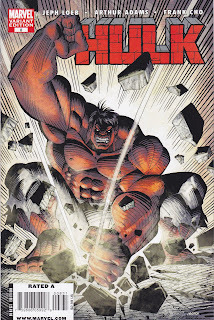 And today(ish), Marvel Comics have published #600 of their monthly Incredible Hulk comic. I've decided to use this as an excuse to pay tribute to the big green one, and my favourites of the people who have brought him to life. I've got to start with co-creators Stan Lee and Jack Kirby. And furthermore, I really want to! When I was a kid, I was given a great paperback collection which reprinted the first six issues from 1962. 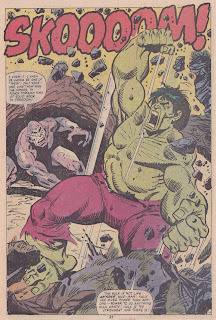 I'm grateful for that as I now consider these "the real deal" Hulk, comics-wise. Lee and Kirby made it, and it was great. This page is really nice. I love the sense of movement Kirby gets into it. 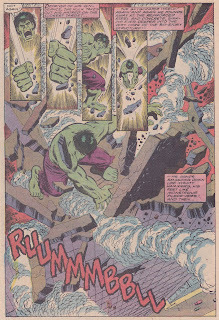 The Hulk's take off in panel 3 (how about those rocks spitting off the ground?). You can feel his weight in space in panels 4 and 5 (and I love the reaction of the character seeing the Hulk for the first time: "WHAT IS -- THAT??!"). And then we have a great example of comics showing you something without showing you it at all. 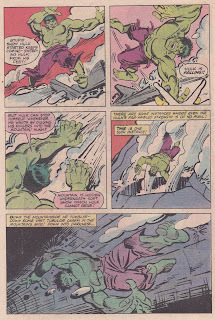 The moment of contact between the Hulk and the Human Cannonball between the bottom 2 panels. That is pure comics at work. Do yourself a favour and sit down at the Online Public Access Catalogue in your local library and do a search on "comics" and "graphic novels". I've tried this in a few different authorities and it always yields results. "Superman and Superboy fulfill the wildest phantasies, and to the mature adult seem stupid and humourless in their fantastic adventures. Adult violence and undesirable criminal activities still flourish in these American-type magazines and one can only deplore their existence. The Poole Education Committee in August 1963 urged a ban on the importation of this kind of magazine, and they will have the support of all adults who examine these publications." In sending leisurely e-mails to a friend of mine who lives in Paris, I mentioned that I'd started this blog. Like most everyone else he's years ahead of me in entering the blogosphere, so I wanted to get his opinion. Well, he soon sent a link to the blog of a friend of his - Renaud Farace! Who knew that he knew Renaud? Not me. 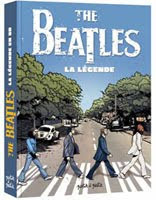 I know of Renaud in that he has been nominated at Angouleme, and has done a Beatles book. I think my friend sent me the link to Renaud's website for interest and reference, to give me an idea of how it's done. But looking at this is a bit scary. There's so much work on there, and it's all really nice! Okay, to tie in with the completion of my latest small press comic Dump #1, I've started a blog. "Because I’m going to be raving for the rest of the review, it’s best to get my one complaint out of the way now: how is it that something that’s this well put together doesn’t have any contact info? 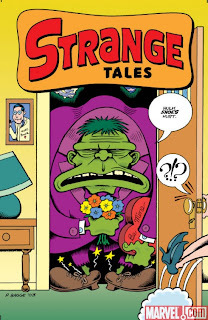 I’m guessing that the website listed above is still David’s main website, as it does have many samples (including stories from this issue), but Berserkotron is prominently featured, not this comic. Usually that would be enough to sour me on a book at least a little, but this comic is too awesome to bother with a little thing like that. There are 10 pieces in this (as I mentioned) gorgeously produced comic. Starting things off is a bit of behind the scenes from the first of the new Star Wars movies, as the Jedi council starts calling each other racists for their disdain for humans and their habit of dying a mere 70-100 years after they’re trained. It’s funny stuff and David does an excellent job of portraying some of the faces on that panel… except for Yoda. That is one brutally ugly Yoda. Next up is Delhi Belly, about a young man who travels and comes back to discover he has Crohn’s disease. It’s not meant to be funny, but the fact that it was originally included in an anthology of poop humor is funny all by itself. Next up is a cautionary tale about pretzel makers and the value of getting your work done first. If you ever wondered what was going on in the heads of the being involved in the UFO’s in Space Invaders, the next story will be perfect for you, war crimes and all. The longest piece in the book is up next, as David takes the challenge to draw one panel for every hour of the day. It’s a fascinating peek into his life, assuming that it’s all autobiographical, as he manages to make a perfectly mundane day amusing. Oh, and spoiler alert: that baby is just a shrunken regular sized person. Next is a thoroughly random piece for Narrative Corpse, which thrives on randomness, dealing with sea monkeys, a shark and a guided tour. Then you have the brilliant piece I sampled below, followed by David’s ideas for what is going on in the head of various models who have posed in classes over the years. Next is maybe my favorite piece in the book (and an excellent reason to visit that website, as it’s featured on the main page), as David imagines a conversation between a man trying to find an appropriate comic for his son and discovering that a comic with robots on the cover (which happens to be Berserkotron) is not necessarily something that’s meant for kids. Finally we get to the title story, Dump, as we rejoin Bert Ainsley from Berserkotron looking for work. 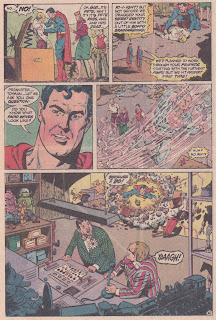 Capping all of this comic wonderfulness off is another recap of how these stories came about and where (in some cases) they were originally printed, and a hilarious online discussion about some of the great books in comics and which ones are appropriate for children. If Berserkotron left any convincing to be done, this issue has done it: this man is a serious comic talent. Once he gets that Yoda down I don’t think anything in the world can stop him. Price is 99p, to my American eyes that looks a little like $2 and, as an American, I am naturally too arrogant to double check."